A few weeks ago, my printer ran out of ink which meant it was time to learn a bit of new vocabulary. At this point, my Italian is good enough that I can work my way around an unknown word, I could easily walk into a store and ask, “Excuse me, do you sell………..the black stuff that a printer uses to write?” While it’s a pretty effective way to get your point across, I still want to improve my vocabulary. When my printer flashed the dreaded low-ink light, I turned to my boyfriend and said, “Fra poco mi servirà la seppia.” I’m going to need ink soon. “Non ti preoccupare, ci sono tanti locali che la vendono.” Don’t worry, there are a lot of places that sell it. I continued to mention my need of “la seppia” for the better part of a week, until I finally had a free morning to run some errands. I called Eugenio to ask him exactly where I could find “la seppia.” He told me that there was a shop next to his bar, but he didn’t give me much more detail. No problem, his aunt & brother were working at the bar that morning so I could get the rest of the information from them, all while enjoying my usual cappuccino and cornetto. “Dov’è quel negozio qua vicino che vende la seppia per stampanti?” Where is the shop near here which sells “la seppia” for printers? No response. I was surrounded by blank stares and puzzled faces. I’ve become used to this reaction though; it usually means that I’ve been sloppy with my pronunciation. I repeated my question, paying special attention to my cadence and careful to correctly roll my rrrrrrrrrs. Again, blank stares. Okay is my accent really that thick?!? “La seppia per una stampante?” asked Eugenio’s aunt. “Si!” relieved that finally someone was able to repeat what I was trying to communicate. Once someone with a native tongue repeats what I said, everyone is usually on the same page. But no, everyone still remained confused. Okay, something’s not right. 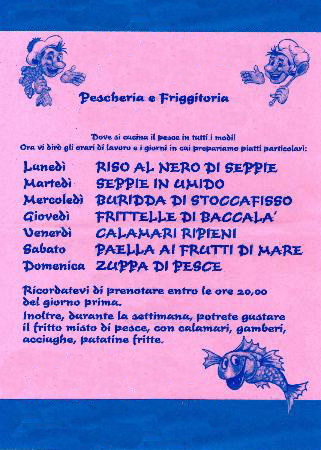 I heard Cico, a regular at the bar, say “Bella, dovresti andare alla pescheria per trovare la seppia.” You’d have to go to a fish market to find la seppia. And at that point everyone busted up laughing. And then it hit me. I never actually consulted a dictionary to determine what the Italian word for “ink” was. I used “la seppia” because it’s always written on the menu for squid-ink pasta. If I had paid more attention, I would have realized that the dish is called “pasta al nero di seppia” – literally, pasta with the black from a seppia. “Nero” refers to the ink. “Seppia” is the animal that produces the ink. Which meant that I was essentially asking for a place that sells squid for my printer. After a good laugh at my expense, Eugenio’s aunt informed me that the word for ink is “inchiostro,” and with this knowledge I was able to buy a new printer cartridge. But first I made a quick phone call to my darling boyfriend to chew him out for not having once corrected me. I must have used “la seppia” incorrectly a dozen times. And therein lies one of the challenges of a life in a foreign language: you make mistakes, and you make them often. People don’t want to correct you because they find your errors endearing. You don’t want to be corrected too much, or else you lose confidence. But at the same time, you also don’t want to walk around asking for squid for your printer. While I have no answer for how often one should correct a non-native speaker, I will say that I learned a critical lesson: to learn a new word, I need to consult a dictionary rather than a menu (or my boyfriend for that matter). This entry was posted on April 1, 2013 by Katie. It was filed under Italy, Parola del Giorno and was tagged with expat life in Rome, Italian, Italian words, life in a foreign language, life in Italy, living in italy, pasta al nero di seppia, running errands in Italy.